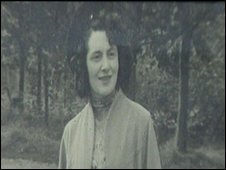 A French resistance heroine who saved more than 100 lives and survived a Nazi death squad has celebrated her 104th birthday at home in North Somerset. During World War II Andree Peel - known as Agent Rose - helped British and American pilots escape occupied Europe. After the war she received a personal letter from Winston Churchill congratulating her on her work. She was also presented with the Croix de Guerre, the American Medal of Freedom, and two Legions d'Honneur. When the Nazis invaded France she became involved in distributing secret newspapers before being promoted within the Resistance to head of an under-section. Agent Rose and her team used torches to guide allied planes to improvised landing strips and smuggled fugitive airmen onto submarines and gunboats. "I saved 102 pilots before being arrested, interrogated and tortured. I suffer still from that. I still have the pain," she said. Mrs Peel met Englishman John Peel while working in Paris and came to live in the village of Long Ashton. "I was born with courage," said Mrs Peel. "I did not allow cruel people to find in me a person they could torture."